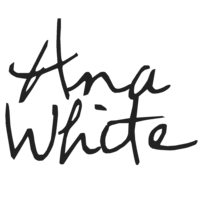 Hi there, it's me, Ana White! I am a mother and homemaker from Alaska. I like to build things, especially things made of wood. At first, I hand drew out my plans, as I was clueless about 3D programs. Eventually, I downloaded Google Sketchup and learned the program so I could create better diagrams for my readers. Blogging has become so much more than just a means of sharing my plans with others. I've made dear, dear friends, I've been inspired, and my readers have challenged me to build things that even I though not possible. I could not be more thankful for the opportunity to do what I love for a living. Where are the measurements for the cuts? Also where did you get the fabulous cushions for the sectional? Love them! Thanks for adding the download with the measurements. I can't find the measurements. Where did you find them? I'm soooo looking forward to my first build. Thanks for making this so easy. For those of you looking for the measurements up at the top is a link. Right Below "Outdoor Coffee Table" is the link. There is a link to the plans with measurements above the Steps section. Love this project! Why would you stain before making your cuts!?!?!?! Now you have to get the stain out again! Hi, Where are the cushions from? Love them!!!! Hi Ana! Love this sectional. We are going to make it and sew our own cushions. What size are your back cushions? Trying to figure out the ideal height of the back cushions. Was thinking maybe 15" high. What do you think would be ideal? Where did you find the cushions? It looks very nice but what would make it better is if all exposed edges were rounded over with a router and the back had an angle to it. Yours looks nice and comfortable. Where did you get your cushions from? How many 2x4's are needed to purchase for both pieces, the couch and sectional part? or can you attach a link so that i can print it? How many 2x4 are needed for both projects? How many 2x4's are needed to do both sofas? And are there plans for the other sofa? Please help!!! Do you recommend pre drilling a "guiding holes" for the screws, or can i skip it when using these type of screws you menttiom (exterior decking screws) Thanks! Do you recommend predrilling guide holes or simply use these deck screws straight? It is not allowing me to print out all the steps. Can you send me a link with all of the steps? Great project, I'm in the process of building one :) There's on piece missing from the list. It is (1) 2*4 @ 28"
Unable to see the page or the plans. Is there a way to fix this? I'm very interested in trying to make this amazing sectional. How do you prevent it from rotting, termite... and other damages might be caused by weather and bugs since it stays outside? You can make this entire project using 2x4x8 if you make it exactly 2 inches smaller from front to back, which only makes 2 differences in cuts, instead of 25 1/2 they become 23 1/2, and instead of 28 1/2, they become 26 1/2, everything else remains the same, but you can use exclusively 2x4x8's with a total quantity of (21) 8 footers! Cuts the cost nearly in half and allows for more choices for straighter and more perfect boards. In case this helps anyone! Thanks Anna, this is really helpful. Will probably use it in my kitchen. Can't wait to do this project!! Oh my goodness, I can't wait to do this! This is exactly what I have been looking for! Thanks so much Anna White. Made this as part of my wife's mother's day gift. Sanded all the corners and added a nice stain. Came out beautiful. Thank you. Starting this build next week, I am making it as a christmas gift for my Mother whom loves gardening. I am thinking maybe using Cedar? Any recommendations as it will be kept outdoors all the time. I am assuming all these measurements are in inches? It looks like the tool bench my dad built for me when I was 4. Except the back has pegboard and the bottom shelf has plywood on the bottom of the 2*4's so it makes a scrap wood storage shelf with the 2*4 lip around it. I still have it if you want a photo. (I am 11 now) We have the same initials Anna. A&W like the rootbeer. I have an A&W shirt for that reason. (I don't really like the rootbeer, but fun to have a shirt with my initials on it. Thanks for the plans Ana. Where can I get the plans for this item? I found the step-by-step instructions. However, there apparently is no way to print it out, am I correct? Correct, it is not a downloadable file but can be viewed from the screen. However, if you have a MacBook you could always take a screenshot of the instructions and print that screenshot picture. I know this video is 3 years old, but is there a reason why there is no audio? I tested to see if earphones weren't working, but that is not the case and my volume is up to max level. Nevermind, I fou d the video and watch directly on youtube instead of on the ryobi website. Sorry you had trouble and glad you found the solution! My son is building this potting bench for me. Id like to know where i can get hooks like the ones in the project. was a fun first project for me! Where can you get the measurements for this project? This was a great one day project! Thanks Anna. This bench turned out great. I modified the dimensions slightly to fit on my deck. It is 33" wide x ~18" deep. It doubles as the platform for my bird feeders. Is there a way to post pictures? Thank you Ana White. You can upload a new project showing how yours turned out! We would love to see! This is great! I just saw a preview commercial for the new HGTV Smart Home 2015, which premiers later this month, and they showed a mirror just like this from Ethan Allen (I assume - that's where they say their furnishings came from.) As soon as I saw the commercial, I knew I would be duplicating the design. We are downsizing, having a smaller house built, & I am looking for ways to expand the space & bounce more light around. This is just the ticket. Another wonderful project from the talented Anna White. Thanks again! It was a super fun project and it makes my living room seem double the size! I love this mirror, and I really want to make it! The other tutorials I have seen say to use plywood for the back, gluing the mirrors to plywood instead of the frame strips. I like how much lighter it will be without the plywood and the frame instead. It says you can make this mirror any size - even as large as a piece of plywood. If you were to make it larger, say 5x6 mirrors instead of 3x4 mirrors, would you still use the same board sizes to create you frame? Will it be sufficient to hold the weight of additional mirrors? I made this and I've had so many friends and family complement and tell me it's beautifully. If you decide to make this just remember that the mirrors are NOT 12" squares. I learned this the hard way and had to do a lot of sanding to get the larger then 12" mirrors to go into the 12" x 12" frame space. The project was simple, but running off 14 pages of instructions, of which 7 were a waste of paper and ink, makes me wonder if it is worth printing any more project plans from this site. Really? Why not tell your printer to print one page at a time and then you don't have to print the "useless" pages. You must be a man! Bahahaha! P.S. This is an awesome plan and I will be printing off the supply list and going to the store today and it will be on my garage wall by tomorrow night! You do beautiful work. Thank you for sharing. This is fantastic. I've always wanted a faux fireplace. And the storage is ingenious'.'.'.'.'. How could I make this safe to burn candles in? Or not a good idea at all? Hi Ana, great idea. I have been looking for a plan like this but with an electric fireplace in it. Do you think it could be possible to insert one in?? And would you have to add extra supports, to compensate for weight of electric fireplace. I would really like to make this it will be great in my living room. Keep up with the great ideas. This looks great! Do you think any adjustments would be needed if you wanted a stone top for the mantel? It also doesn't look like you mentioned that the middle door needs a piece of wood attached to the main structure to stop it from closing into its own opening. The video shows that you added this piece of wood, but the plans don't include it. .. also, the back paneling measurements in the cut list don't match the diagram. Basically if someone followed the cut list and the diagram, they would have a hard time building this, because there are alot of incinsistencies. It should really be updated if it's expected that a novice could use this. Thanks, joescornhole_52170, for the heads up on the measurement discrepancy. The cut list will be updated. I would also wanted to build this and have an electric fireplace insert during winter and take out during the warmer seasons. Love this. How do I attach it to my wall as I intend to put my TV on top of it. I love this and want one sooooooo bad. Is there anyone who lives near Florence,ky that would know what their doing that can team up and help me do this !!! What would I need to do, if anything, so I could add an electric fireplace insert? I love this. The blueprints should be working now, @RayeRaye27. Thank you for notifying us! Ana's blueprint link states: "The resource could not be found." Love this Modern bookshelf. It will look great in my mid century redesign, living room or dinning area.